So as you read, in this hadith there is information about Khawarij (Out from Islam Sect) and upon reaching of (dhul khuwesra) of Najd, Prophet alehisalatowasalam said about him and his people (means people from his lineage and tribe) will arise, and what will they do? And who are killing Muslims? That means that Today’s So called (Salafism – Wahhabism – or Ahle Hadees-ism and Deobandism) (these all four which are found mostly in Indo-pak sub continent and Salafis in mostly Arabs. 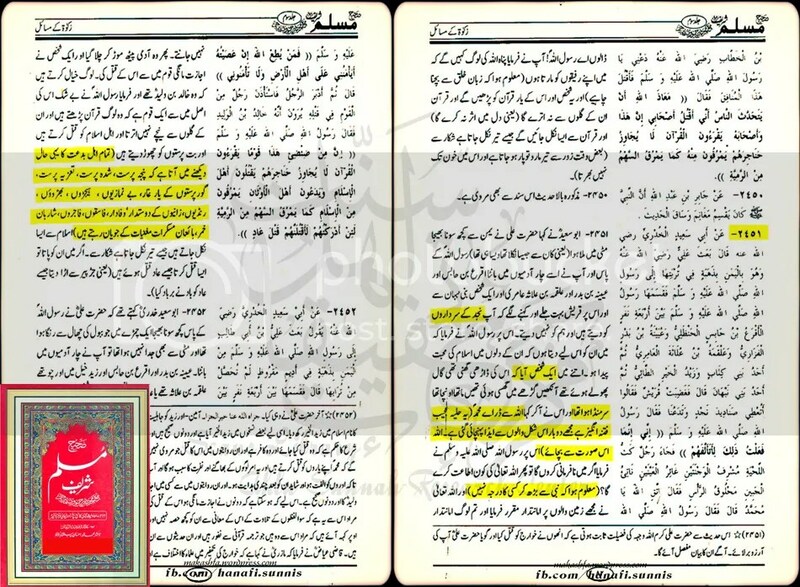 Now Molavi Waheed-uz-Zaman of (Deobandi / Wahabism) or the Publishers Khalid Ehsan Publishers Lahore Pakistan, who published are responsible for all those Yellow lines in the Scan. 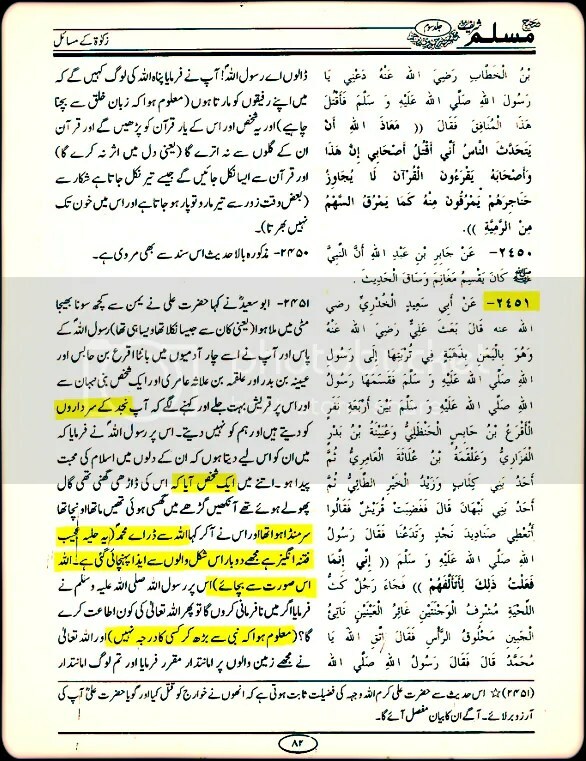 These lines which are (Yellowed) are not the words of Hadith neither it can be said that these are words of Imam Muslim (rd), nor we can say that Any of Muhaddith in the History of Islam ever exaggerate this hadith with such wrong interpretation. Molvi Waheed is talking about Khawarij and suddenly by giving brackets he is adding his own words into the words of Hadith. Which is called Fabrication , Lie and upon doing such thing, there is Lanah on those in Islam. i.e. 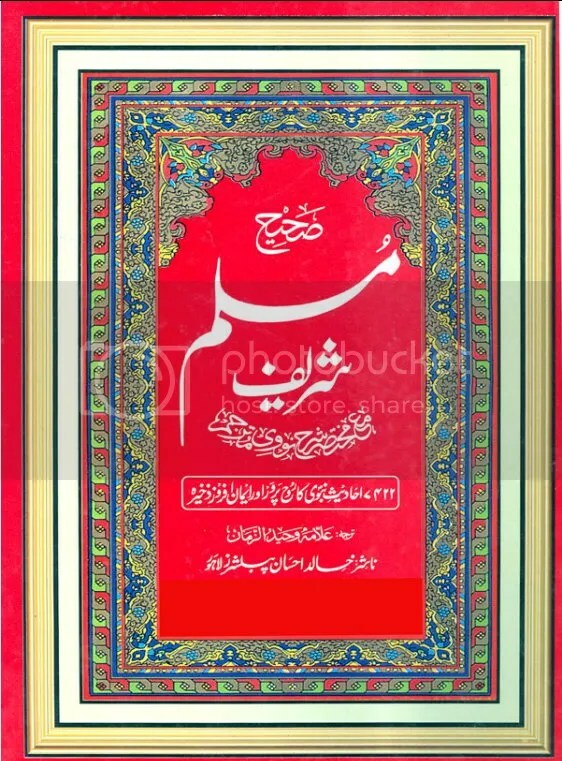 (Lanatullah e alal Kaazibeen). Let me fully translate his addition. You see this piece of crap has added his own words in such a long sentence and then tries to convey the masses, that Khawarij means Ahlu-Bidat. 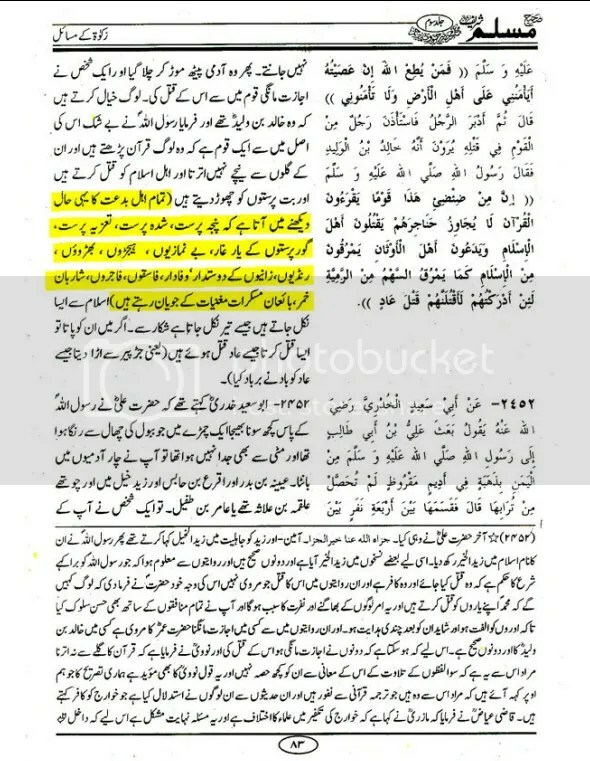 While whatever allegations he raised by using such ugly dirty filthy words in the words of Rasul Allah alehisalam, if he was alive I would have surly kick his “A” for doing ignorant analysis of Hadith and trying to change and divert the minds of the people from original context of hadith, because this hadith exposes their occult badly. So they did this crime. These are neither the words of Imam Muslim and nor any of Muhaddith as I explained ever take such exegesis of such hadith. May Allah punish those all in hell who are trying to change the authentic words of the Blessed Prophet Peace and Blessing be Upon him. Aameen. ده مولوي وحيد الزمان چه کم ده ديوبند او دَ وهابيانو مشترکه امير وو هغه چه کمه ترجمه ده مسلم شريف کړې ده په هغه کښ اي مکمل تحريف کړے دے لکه چه دا ځديث چه کم په اصل کي خوارج په حقله وئيلي شوے دے په هغه کي مولوي وحيد دَ ځان نه تړے مړے وشتې دې، خوارج سره اي تعلق ده اهل بدعت جوړ کړو چه نه چرے هيڅ محدث او نه چرے هم چا فقيهه ده دې حديث نا دا معني اخذ کړې دې ، او دې ته تحريف وئيلي کيږې، حالانکه ذکر ده خوارج روان دئ او نبي عليه السلام ده هغو نخه هم ورکړۀ چه خوارج به څوک وي.